WR Kaycee Clark (#8) is greeted by her teammates after a 48-yard reception for the game's first touchdown. SANTEE (06/21/2014) For the first time this season, the San Diego Surge allowed an opponent to put up more than six points. Quarterback Nikki Johnson provided a spark for the Showgirlz in the first half with a 50-yard touchdown pass to Maria Rodriguez, and a two-yard quarterback keeper for a score. "We knew they were going to come out fighting," Surge quarterback Melissa Gallegos said. "I'm glad they did, it made for a good game." It was a great effort by the Showgirlz who held the Surge lead to 20-16 at the half, but a 28-0 run in the third quarter proved to be too much. With the win, the Surge advance to the American Conference Semifinals where they'll take on the Seattle Majestics (8-1). "Playing the season that we played so far, I didn't feel we were battle tested," Surge head coach William Harris said. "We haven't been punched in the face all season, and this game opened our eyes." 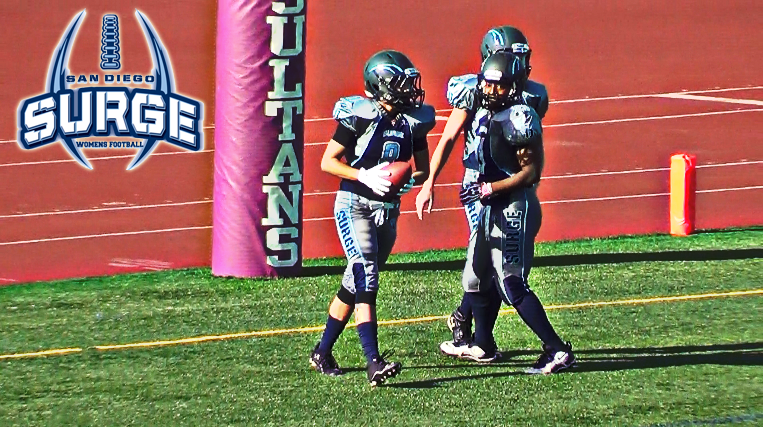 Due to the WFA's American Conference "travel rule" for the third round of the playoffs, the Surge will have to take a trip to Kent, Washington for their conference semifinal game against the Majestics. The game will take place at French Field on Saturday, July 5th with kickoff scheduled for 7 p.m. pacific time. The "travel rule" states that a team can't play on the road for consecutive rounds. Since Seattle was forced to play at Central Cal this past Saturday due to having a lower Massey Rating, they earned the right to host their next game after escaping with a 13-12 win. Had Central Cal picked up the win, the Surge would have been scheduled to play them in San Diego. Prior to the first round of the playoffs, Seattle (who had a first round bye) were ranked higher than the Central Cal and expected to be the home team in their second round matchup. But after Portland and Everett suffered blowout losses in their respective games, Seattle's strength of schedule took a hit causing Central Cal to pass them up in the following rankings. Go HERE for WFA playoff rules, information, and updated brackets. You can help the Surge fund their trip to Seattle by visiting SanDiegoSurge.com and clicking the Donate link.